Ben Bernanke's gift to the markets on Wednesday December 18, 2013 in my review was really no big surprise. What would have been a surprise was an announcement that in the coming year the Fed was actually going to move to a neutral monetary policy. But, as I stated in my last article, "now is not the time to exit stocks". Currently the signals are simply not ripe for a stock market breakdown because there is no resistance in place to trigger such an event. If you have the chance to read my book, Theory of Financial Relativity, you will have a much better understanding of the history behind my perspective and forces and metrics to be wary of when a true market correction is about to take place. Stock Market in 2014 - Can the Run Continue? During 2013 the rise in stocks (SPY) (DIA) (QQQ) has, in my observation, been all about the flow of funds, not economic fundamentals. What I mean by this statement is that currently investors have choices about where to invest their funds. Presently with interest rates moving up from historically low, Fed regulated levels, the demand for long duration 10 to 30 year, and now even medium duration 5 to 10 year credit based securities is low. Meanwhile, new supply of Treasury securities in the middle of 2013 was non-existent thanks to lower government spending levels and the constant Fed QE program. The Fed QE program is ironically for the Democratic White House which is driving the current economic plan, designed on the premise that lower government financing needs combine with QE will displace funds in the Treasury market that will somehow “trickle down” into the real economy. So far it appears the effect is widely uneven, as top line revenue growth at businesses is flat, even negative for the DOW companies by my measure on a trailing 12 month basis. The net result is that investors are choosing more and more to put money to work in stocks rather than bonds in order to get a return on assets. 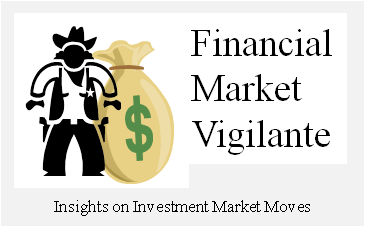 In watching this phenomenon unfold, it has been particularly evident that much of the money being flushed out of the Treasury market has a preference for the U.S. major market indexes, most likely due to the higher liquidity of the major exchanges and the ease of trading ETFs. With this observation, I decided to do a correlation trend analysis on the market capitalization of the DOW as a function of the change in the size of the Fed balance sheet since the end of 2008. The result is the visual graph shown below. In the high speed internet world it is easy to get your message drowned by all the traffic. 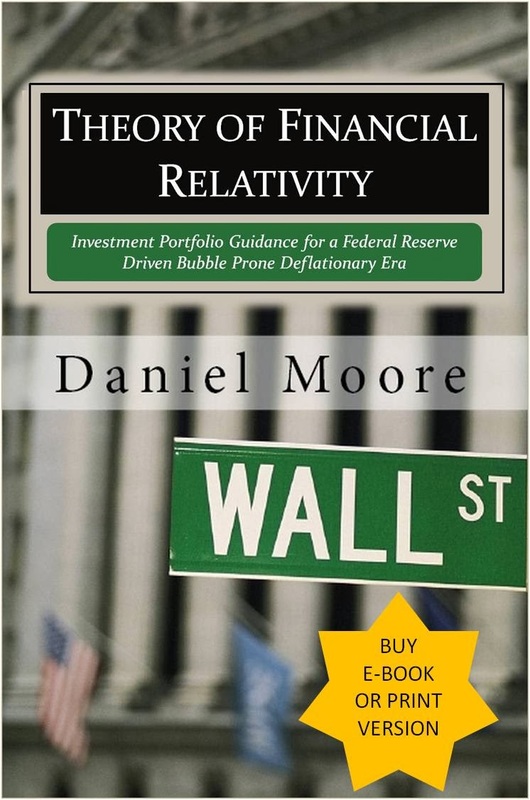 But on December 11, 2013 G Willis, a financial adviser to Federal Employees and Veterans in San Diego through his web portal know as GubMints, published a thorough review of Daniel Moore's book titled Theory of Financial Relativity. "Daniel is who I like to call The Most Interesting Man in the Financial World. Not because he earned his MBA from from Duke's Fuqua School of Business, but because of his life experience. You see, Daniel has had ringside seats for the biggest financial freak shows of the past 3 decades- Creation of the Mega-Banks who were 'Too Big to Fail', The Internet Hardware Bubble, the Silicon Valley VC Frenzy of the late 90's, and the California Housing Bubble of the 2000's.This life experience led to Daniel's financial opus - The Theory of Financial Relativity." Is it by coincidence that this past year has been filled with events bearing resemblance to the market in the late 1990s? I personally have battlefield experience in the technology capital market during the late 1990s, and the market trade is too analogous to ignore. Show me social networking companies going public with sky-high valuations like Twitter (TWTR) and LinkedIn (LNKD) or other tech companies with high cash burn rates and uncertain revenue models doubling in price on the first trading day post-IPO, and I say deja vu. Need I point back to the many companies that were taken public, only to fold in the late 90s boom like Sycamore Networks, Pets.com, Webvan.com. The stream of IPOs is a function of the flow of funds in the capital market, triggered to a large degree by Fed policy and U.S. fiscal policy and the resulting interaction between the foreign capital markets and the United States. Not by coincidence, many of the government bureaucrats from the Clinton administration have had a hand in architecting the Obama economic plan. So, you can imagine why we are seeing comparable market results today.